My husband, Steve, carrying two porcupines but no warthog, walked back to the village outpost, which was nothing more than a couple of mud huts and a watering hole. He and his West African hunting buddies sank into bamboo chairs in the shade under a rice-sack lean-to. They’d have to wait until evening to try again. The conversation died down, and a few of the men drifted off to sleep. 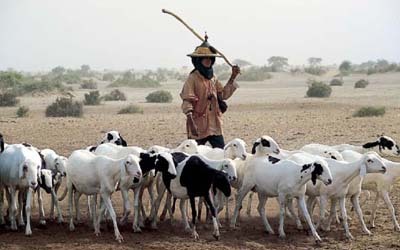 Steve was awake, though, when two flocks of sheep arrived at the watering hole from two different directions, each led by a Fulani man carrying a shepherd’s stick across his shoulders. Sheep from both flocks melded together in one bleating, thirsty mass. The shepherds spread out their mats under a mango tree and brewed tea over a little fire while the animals drank and milled around. About an hour later, one of the shepherds stood to leave. He didn’t even glance at the sheep. He just took out a tin can and beat a rhythm on it as he walked away. Half the sheep scrambled, pushed and even climbed over others in a frantic effort to follow him. The shepherd chose a path next to Steve’s lean-to, and the sheep, many running to catch up, did too. The other half of the sheep? They just hung out at the watering hole, unfazed. Their shepherd still sat beneath the tree. As Christians, we may mingle and blend with another flock, but the sheep who belong to the Savior follow His voice. In Him we have safety. In Him we have everything we need. Sheep need the care of the shepherd. Left to their own, they overgraze their food source, and have a tendency to get themselves in difficult, life-threatening situations. They simply need the overseeing protection of one who is wiser and who can meet the needs they are unable to meet on their own. No wonder God often uses the image of a shepherd and his sheep. Left to our own, we take the good in front of us and misuse it to our destruction, we let ‘blessings’ over come us until we cannot stand under the weight of it all, and we love to see how far we can stretch the boundaries until we find ourselves in difficult, sometimes life-threatening situations. We need His care. His protection. Security comes from the shepherd. He tends His flock with wisdom and love. He leads us to green pastures and guides us to calm waters. He meets every one of our needs. And all I need to do? Simply follow His voice.